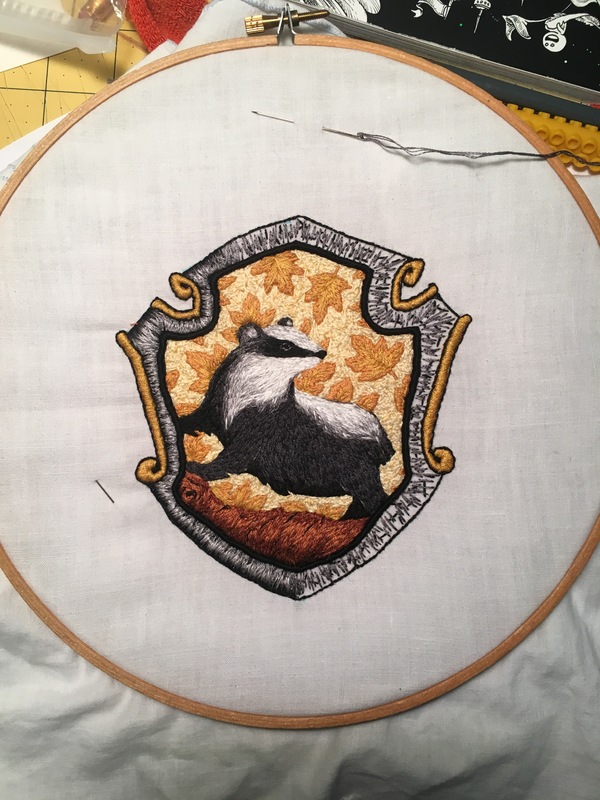 I’m hoping by the end of the weekend my little Hufflepuff Badger will be done. Only 3 more colors to finish up, then a quick press and into a frame. Today is day 15 since starting it. Some days I was able to work on it for hours on end. Others I had to grab a minute or 2 when I could. Only one of those days did I not touch it at all. Not too bad considering the majority of my projects sit untouched for months. It probably helps that I have to mail it this week. 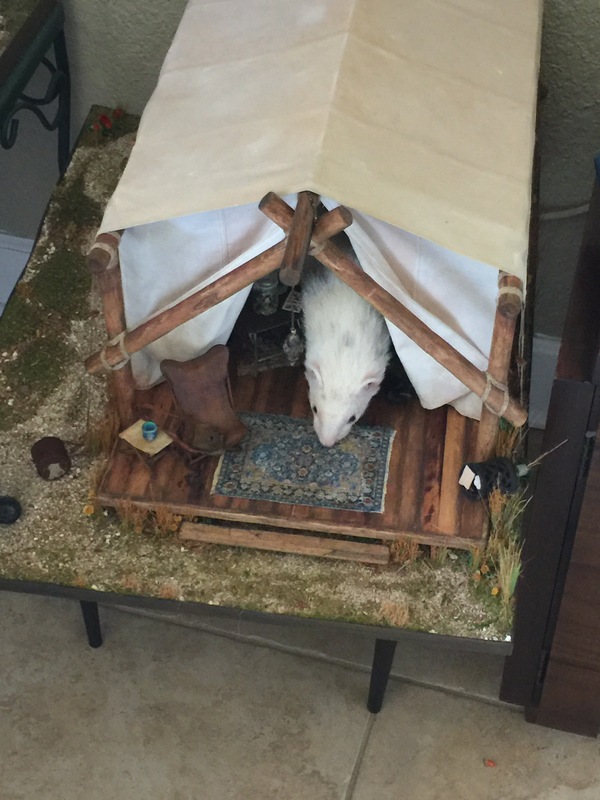 I’ve seen people post pictures of their cats in their dollhouse builds. I have 2 cats (Skippy, who is pictured, and Penny) who couldn’t care less about my dollhouses. The closest my dog, Bolt, has gotten to the dollhouses is when he runs into their tables while playing with the kids, and I have a mini heart attack. So, I’ve always thought how lucky I was. Then I received this picture in a text from my husband this week. A few months ago, before Bill was adopted, I had asked for help building plexiglass cases for them. I guess I’ll need to get more serious about following up on that request. Yeah for being almost finished! He’s a dapper badger, and I am loving the colors so far! Skippy looks like a gentle, peaceful kind of soul – that’s my Rusty. 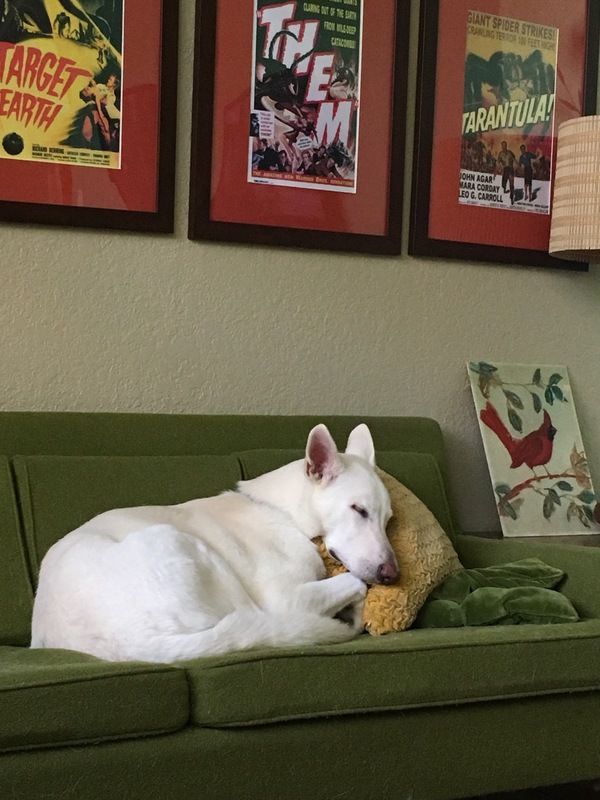 Bolt seems to know that he has scored with his people because he gets to nap on a fashionable sofa with comfy throw pillows. For the cases, look at some YouTube videos on “welding” acrylic. I did it for the shower in one of my dollhouses, granted on a much smaller scale, but it was super easy. You could also build a wooden frame and screw the acrylic to it. With hinges for access. Skippy looks like my Miho. 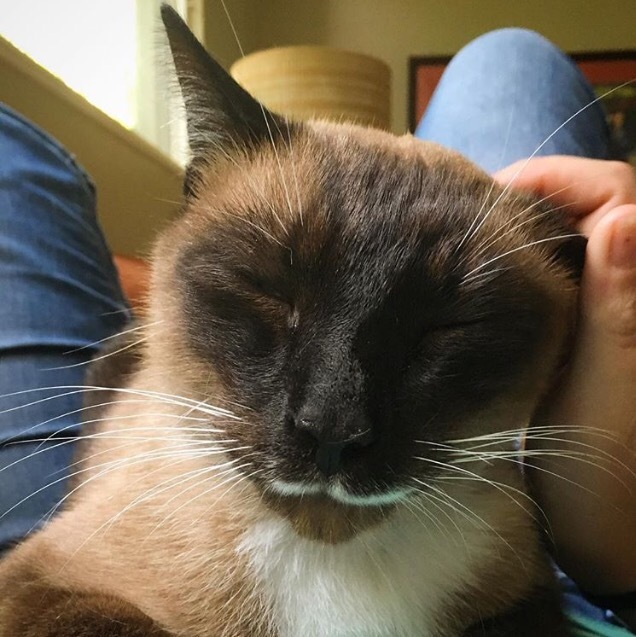 Seal point Siamese. Oh, that sounds like a good idea! Skippy was a stray that a neighbor left behind. He’s spoiled now. Not a big fan of the other animals, but puts up with them in return for pets, lol! Ahhh! I’d have had a heart attack.